Level 1: $1,750 for ASCs performing 1000 cases per year. Level 2: $3,000 for ASCs performing more than 1000 cases per year. President’s Council: $1,500 for each individual ASC owner, surgeon, or staff member who elects to join. When you belong to OOSS, you engage your entire ASC facility team. A single ASC Membership includes a Primary Physician (typically an owner and/or medical director), an Administrator, a Director of Nursing, and a Billing Contact. Titles may vary. Additional members can include affiliated physicians and clinical and business staff. Individual ASC team members may elect to join the OOSS President’s Council for an additional $1,500 per seat. Special Membership is granted for medical students, military personnel, and individuals and organizations representing ASC corporate groups and startups. OOSS also collaborates with industry partners and offers an array of OOSS Partners programs. For more information contact Executive Director Kent Jackson at kjackson@ooss.org or call (720) 550-7667. ASC facility membership dues are not deductible as charitable contributions for federal income tax purposes. A portion of the dues (70%) may be deducted as a business expense; 30% supports advocacy efforts and is not deductible. Contributions for President’s Council support advocacy efforts entirely and, therefore, are not deductible as business expenses. Consult your tax advisor accordingly. Membership is not transferable or assignable. Dues are computed on a calendar-year basis and are payable by January 1. No refunds are permitted. Membership in the President’s Council is open to all OOSS members and is a way to lend your support to OOSS efforts in Washington, D.C. and at the grassroots level. Membership includes the benefit of invitations to the annual Meet & Greet Receptions at the OOSS Perspective @ ASCRS and OOSS Symposium @ AAO events. 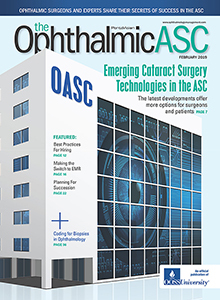 The personal contributions and strategic guidance of Council members enables OOSS to go above and beyond in advocating on behalf of the ophthalmic ASC community. Our informed and aggressive stance on office-based surgery, orchestrated efforts to address sensible standards for sterilization, and collaboration to challenge onerous payer tactics that put our patients at risk are good examples of concerted research and advocacy efforts made possible by President’s Council support. To renew your President’s Council membership, you may do so with the payment of your facility dues or by individual contribution.